I sniffed the air. I didn’t smell anything other than the woods. “I smell trees,” I said. There are moments...moments that define things and give clarity. For me that moment when Ox meets Joe defined this audio book for me. Once again the perfect narrator has been matched to one of TJ Klune's books. Kirt Graves has taken a story that I loved I mean really, truly loved. 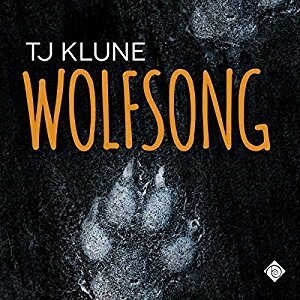 'Wolfsong' was on my Top 10 Favorite Reads for 2016 and for everything that I loved about the book the audio book has truly enhanced it that much more. While this isn't my first time listening to a book narrated by Kirt Graves without hesitation I can say this is my favorite audio book that he's narrated and not just because of the story. While I've enjoyed the other books Mr. Graves has narrated this is the story that's effortlessly drawn me in and held me in its grasp from start to finish. While all of the voices that the narrator created worked for me. It was Joe and Ox's voices that I absolutely loved...especially young Joe's voice. Mr. Graves captured the expressiveness of Joe's voice perfectly with all of his youthful exuberance and Ox's thoughtful and methodical contemplation of things was conveyed perfectly with every world that he spoke and had it just been these voices that I connected with it would have been a good story but I was also quite taken with Gordo, Elizabeth, Mark, Thomas and the other pack members. While the bad guys...well trust me their voices conveyed the darkness that their hearts contained as well. I'm not really sure that I have the words to clearly express how much I loved the audio book version of Wolfsong so I think the best way to explain this is to say that once again I have selected 'Wolfsong' as one of my favorite books for 2017 only this time it's because of the audio book that I felt compelled to do put this book on my 'Best of' list. Audio book or e-book...this one is full of pine cones and candy canes and epic and awesome.